Home > Blood Thinning Medicine > Which Drugs or Foods React With Agrylin? Agrylin, also known as anagrelide, is prescribed for a number of illnesses including thrombocytosis and is commonly used as a way to help prevent blood clots. It is a platelet-reducing agent and it can reduce the risk of illnesses related to blood clotting such as intestinal bleeding, stroke and heart attacks. 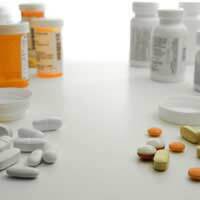 You should tell your doctor or pharmacist if you are taking any other prescription or nonprescription medicine, including herbal medicines, illegal drugs or dietary supplements. Alcohol should also be avoided for the duration of taking the medicine. This list is not exhaustive and you should consult your doctor or pharmacist to discuss any other medicines that you are taking. If you have ever had a reaction or food allergy before, it is advised that you make your doctor aware as agrylin might not be the right drug for you. Agrylin should not be taken if you have or have had any history of heart, liver, or kidney disease. You must let your doctor know if you are pregnant or planning a pregnancy before using this medicine, because it may be harmful to an unborn baby. Also, if you are breastfeeding, be sure to discuss with your doctor before using this medicine. Agrylin can cause allergic reactions like skin rash, hives and swelling of the face. It may also cause dizziness, breathing problems or irregular heartbeat. Because it reduces platelets, some unusual bleeding may occur. This can lead to headaches, nausea and feeling weak and tired. If you have any of these symptoms or any other unusual side effects, you should consult your doctor immediately. Agrylin may also trigger increased sensitivity to the sun. When taking agrylin, it is advisable to avoid exposure to the sun, sunlamps, or tanning booths until you are aware of how you react to the drug. Ensure to use sunscreen or protective clothing if you must be outdoors for a long period of time. It is important to take agrylin in the correct way to avoid any reaction. Always read the label for the exact instructions and ask your doctor if you have any questions about how to take it. Agrylin can be taken either on an empty stomach or with food. Your medicine should be taken at regular intervals and not more often than directed. If you miss a dose, make sure you take it as soon as you can. If, however, it is nearly time for your next dose, take that dose and do not take the missed dose. You should not take double doses but if you do take an overdose, you should go to the hospital immediately. Only stop taking agrylin on the advice of your doctor as they will monitor your progress when using this drug. If you suspect any type of interaction then check with your doctor. Just because an interaction is not known of it does not mean it does not exist.